Is Growing Up Really Optional? It is said, “growing old is inevitable but growing up is optional.” Can one grow old without growing up? In my opinion, I think so. For the reverse, I would say growing up entails growing old. As it is said that, the older one gets, the less certain things matter. What therefore constitutes growing up or who is considered a grown up? A certain age? A certain educational level? Financial stability? Married? Having kids? What do you think and why? How do you measure growth? How often do you evaluate yourself with respect to your goals and how far you’ve come? Most people tend to do that at the beginning of the year. For me, my new year begins on my birthday which is this month. I not only do yearly evaluations but also monthly which I do during the last Friday of the month and weekly evaluations which I do on Sundays. I set daily and weekly goals in my phone’s calendar which pops up at 5 AM, I have a calendar next to the head of my bed which reminds me of my monthly goals and a few index cards on my notice board with my yearly goals. 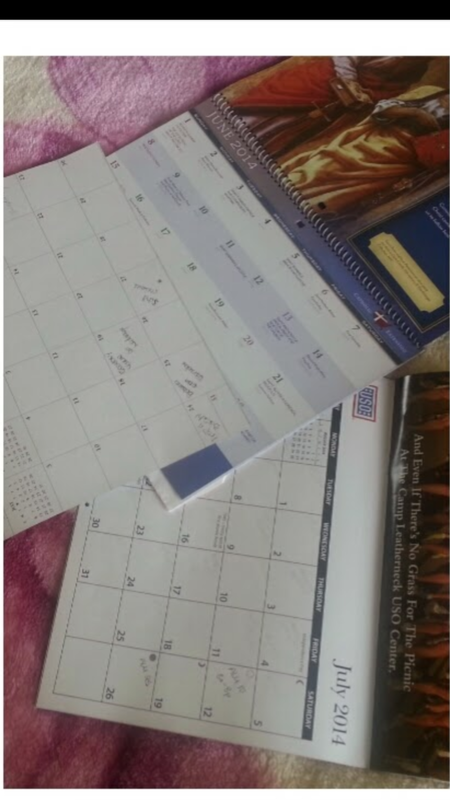 At some point, 2014 to be specific, I had three calendars! I know all that may sound fancy and smooth but best believe it is a challenge to stay on track. I try to update my daily goals against the next day before going to bed which I don’t always get to do. So, I plan to wake up 15-30 minutes early the next day to do so. It may sound like I’m some perfectionist, but no I’m not! And my goal in life is not to be perfect but to be the best that I can possibly be. Oookay! Enough of calendars, goals and growing up. Well not yet! 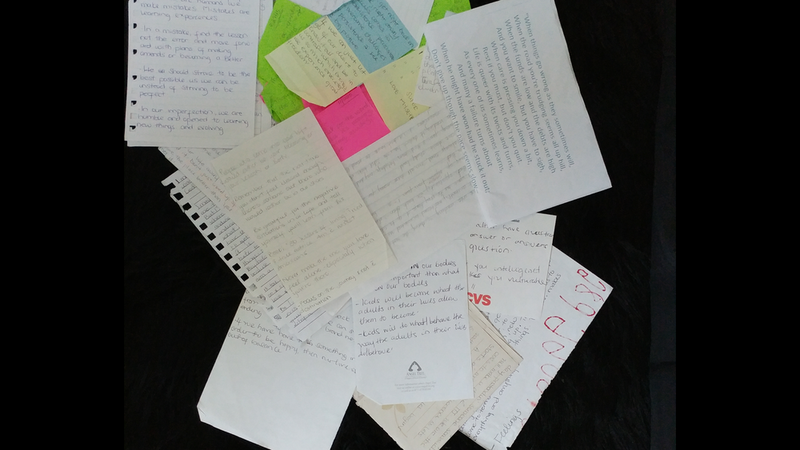 One of my overarching and revolving goal which I set back in November 2016 was to consciously practice, write down and verbalize gratitude daily. Gratitude for how far I have come; in addition to being an Occupational Therapist, I am a board member of HOPE For Children Cameroon based in the US focusing on Education, I am a member of International Center for Disability and Rehabilitation-Cameroon based in Canada. 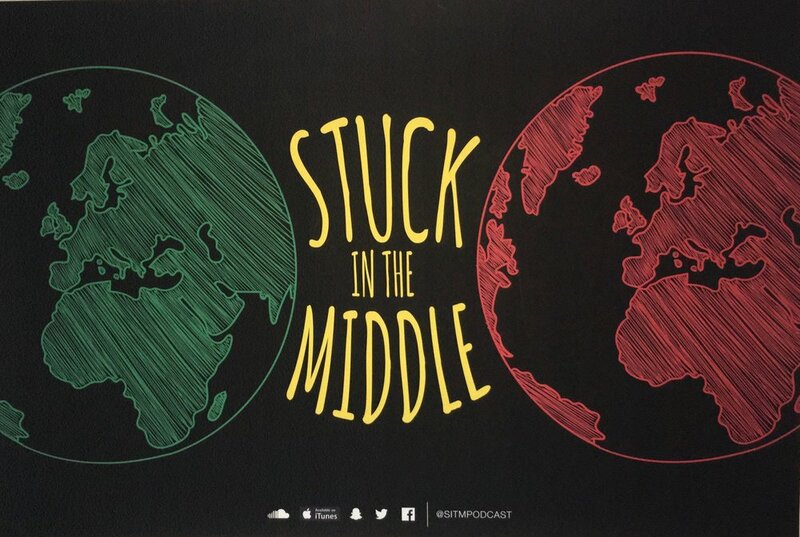 Also, I am a SitMpod crewmember, choir member, family member and friend member :). How do I find time to be part of all this and have time for myself? Well they say if you love what you do… (complete the statement). Other things I remind myself to be grateful for include; the basic necessities and luxuries like washer, dryer, bottled water… etc. Gratitude for the skills/abilities that I have, all that I am blessed with; family and friends, including challenges because they happen for a reason and they do make you better though we may not see it at the moment, it does in the long run. Sometimes I get specific such as I’m grateful for all my ten well-functioning fingers because I remember how it was when I had to wear a thumb brace and still have to occasionally. As an Occupational Therapist, I have constantly and continue to be exposed to experiences that reminds me of the things I take for granted such as, well-functioning gastrointestinal and respiratory system... Throwing out some biology terms ha! But I guess you get my drift. Speaking of drift, we are slowly drifting into Spring season, one of my fav seasons followed by Fall. I love Spring because it reminds me of blossoms and springing to life. Two things I learned about March during the first two days were; well I knew March 8th is International Women’s Day but I did not know that it is women's history month. 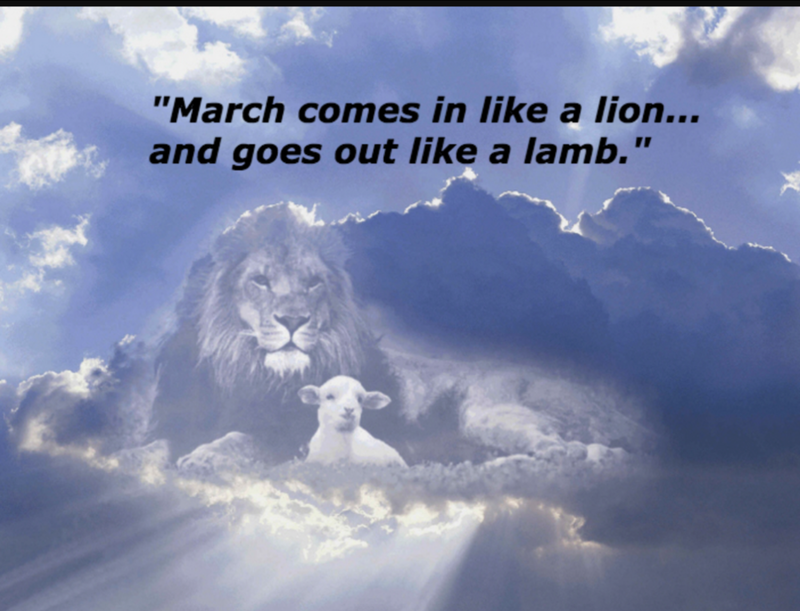 The other thing I discovered is this quote, “If March comes like a Lion, it will leave like a Lamb.” It is used to describe the weather in March which this year in areas of MD, roared in like a Lion. Hopefully, it leaves like a Lamb. Why did this quote stand out to me? Aside from it being used to describe the weather of the month in which I was born, I learned that I have some characteristics which are similar to that of a Lioness and a Lamb. With regards to a Lamb; gentle, calm and collected. For the Lioness; before we start raising eyebrows about what characteristics I may have, let me calm the tide by saying it has nothing to do with being defensive, aggressive or combative. I realized I had those characteristics after going through very challenging moments back in 2015. Towards the end of that year, someone recommended I read Lioness Arising by Lisa Bevere. They had no idea what I had been through and was going through. I was in the process of reading another book when I received this book so out of curiosity, I skimmed through some pages. I beamed as I came across phrases like tenderly fierce, prowess, strength, and passion, empowers and raises a collective roar. And oh it has biblical references like “Lamb of God and Lion of the Tribe of Judah” which reminds me of another book I read at the beginning of this year Chase the Lion by Mark Batterson. When I got the recommendation to read Chase the Lion, my first thought was; who dares to chase a Lion in the first place? I was taking the title literally; as in judging the book from its title/cover. A few things I got out of the book are; if your dreams don’t scare you, they are not big enough or they are too small, having the courage to face your dreams even when they scare you or after unsuccessful attempts, our greatest regrets drawing towards the end of our lives will be the opportunities we left on the table, the passions we didn’t pursue, and the dreams we didn’t go after. This book is another with biblical references. The most typically seen characteristics in me is that of a Lamb, only a handful of close friends have seen/experienced the Lioness in me who is continuing to arise. Speaking of arising, since it’s my birthday month, do you care to know where I originally arose from? As in where I was born? Born in Limbe-Cameroon, went to Yaounde at about three years old then to Douala at about five/six years old. Went to PNEU Yaounde for Nursery school (kindergarten), Government English Primary School Bonamoussadi for elementary and middle school. Saker Baptist College Limbe for junior high and high school; yes, I’m a Sakerette. So I sort of returned to where I was born :) and then traveled to the US in July 2006. At the beginning of 2017, I dared to do the Daniel’s 21 days prayer and fasting and I successfully completed it after two previous unsuccessful attempts the year before. It is pretty much the extreme of being a vegan with a spiritual tie to it. After seeing the mental, emotional, physical and spiritual benefits, I decided I’ll slowly transition to being a vegetarian with the hope to go vegan at some point in my life. I bet there will be questions arising like; what about your future husband, does he have to be vegetarian or vegan? No, he doesn’t have to be, but I hope he respects my choice to be. I may not get to be 100% vegetarian or vegan but there are certain things I have started fading out of my diet/lifestyle. I’ve gotten to a point where I can cook for others and not eat it, I do not care much for meat/beef. So we don’t have to call a family meeting to address where the African in me went to. So, because it’s my birthday month, here with some of my favorite things (in my Oprah voice :). Who has a favorite number?! I do! One and Three are my favorite numbers! Because one signifies uniqueness and three can be completed to form a heart shape. I love my African (Specifically Cameroonian) dishes such as Ndole and the other vegetable which starts with “O” which I can’t spell nor pronounce correctly (hahaha). I challenge you to figure out which vegetable I’m talking about and comment below ;). I eat it with boiled or fried plantains (yea I know; unhealthy). Another dish would be groundnut soup (peanut soup) and brown rice. Over to the liquids... What are you currently drink as you read this or what was the last thing you drank? No, this is not about to be a sermon or what is good to drink or not drink but whatever you drink, be mindful of the quantity because your liver will remind you at some point. I love plain water; maybe with some lemon/lime. You can find a bottle of water in every one of my bags/purses and multiple corners in my room. Tea anyone?! I love herbal tea which I now drink without any sweetener; not even honey. Favorite teas; ginger tea, peppermint, chamomile, dandelion and green tea; in order of preference :) (Are birthday gifts coming my way :)?) How about wine?! For grown-ups only! On the alcohol side, I’ll occasionally (maybe once, at most twice a month) have Moscato related wine, Irish Cream related or Smirnoff Ice related which is when I go out with friends. Pet peeves anyone?! Oh yes, I have those as well; I’m human. One would be leaving dirty dishes on the kitchen counter very close to the sink especially if there's room in the sink for it. Another will be leaving trash on the kitchen counter or in the sink especially if the trashcan is within reach. Also, leaving kitchen cabinets open. I know I’m not the only one who feels this way, there was a point I felt I was so strange/weird in my way of thinking but I've learned and continue to learn to not sweat the small stuff. I had multiple ah-ha moments when reading the book Don’t Sweat the Small Stuff and It’s All Small Stuff: Simple Ways to Keep the Simple Things From Taking Over Your Life by Richard Carlson. It may sound like I have a type A personality, but that's not quite so. Well to a certain extent; maybe when it comes to the kitchen. I tend to consider myself an ambivert; a mix of introvert and extrovert but more on the introvert side. The extrovert side will depend on the environment and my comfort level with the person/people I’m interacting with. Oookay, enough about me!